This beautiful apartment adorned with pre war details is located in a brownstone in one of the most popular area of Brooklyn, bordering the area of Park Slope and few block away from Prospect Park (made by the same designers of Central Park) and subway (5 min walk from the apartment). The area is full of restaurants. Close by Brooklyn Museum, Brooklyn Botanical garden, and easy to access to Manhattan with the express train that will bring you to Wall street in 15 min. With bathtub and shower fix, sink, mirror, wc, shelves hair dryer. Central heating, A/C, cable TV, DVD player, phone, WiFi, hair dryer, iron & ironing board, baby cot available on request. 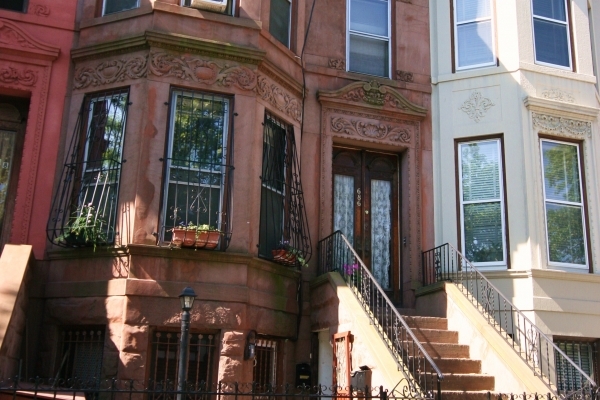 Experience luxury and the soul of Brooklyn in this beautiful brownstone 2 bedroom deluxe suite! The apartment is adorned with pre war details, including original 1900 chandelier, beautiful stained glass, parkay wood floors, and exquisite fire place mantels. 8ft windows reveal views of the lush waterfall garden in the back and the courtyard in the front. We are a family of four and this was our first trip to New York. The accommodation was just perfect and a great retreat after hectic Manhattan. Travelling was easy and the neighbourhood was very friendly. Oltre ad essere innamorata di New York City mi sono innamorata di questo appartamento.....Bellissimo!! Accogliente, pulito e molto funzionale...come a casa! L'appartamento e' silenzioso.....e' confortevole e vicinissimo ci sono tutti i negozi e ristoranti ( anche negozi biologici!!!). La sera tardi, dopo una giornata di caos cittadino, una bella cena e musical....bello tornare in metro li, in un posto sicuro e silenzioso. Insomma, e' la quarta volta che ci vado con marito e figlie....e ci ritorneremo senz'altro!